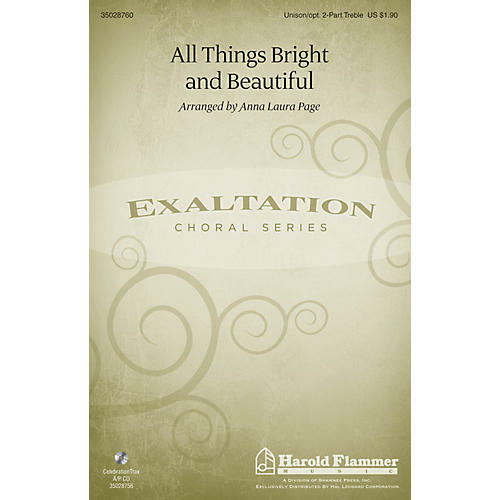 Uses: General, Hymn Arrangement Scripture: Genesis 1; Psalm 104:24-31 This delightful setting of the cherished hymn, All Things Bright and Beautiful, makes a splendid selection for older elementary choirs or any choir of unison or 2-part voices. After singing the familiar ROYAL OAK tune on stanza 1, a new melody spotlights stanza 2. The two melodies join together on stanza 3 in traditional partner-song fashion before concluding with a final restatement of the timeless refrain. Optional flute and finger cymbals sweetly compliment the piano accompaniment during the song's introduction, interludes, and conclusion. Available separately: Unison/2-Part Treble, CelebrationTrax CD. Duration: ca. 3:45 ScorePlay - click to view score with recording.